Addressing humanity’s paradigm shift from linear consciousness to shamanic consciousness, Linda Star Wolf and Nita Gage explore how the art of soul whispering can help each of us understand why we experience our lives the way we do and shift from healing our wounds to embracing the process of transformation. This powerful new synthesis of shamanic healing and psychotherapy can help you restore your relationship with your soul, transform dysfunctional ways of being, learn to hear the intuitive wisdom and love of your soul’s whisperings, and develop the capacity to live in the present moment fully connected and alive. Detailing the shamanic tools and psychospiritual practices of soul whispering, the authors share inspiring stories of transformation from their own journeys and their work as shamanic soul whisperers. 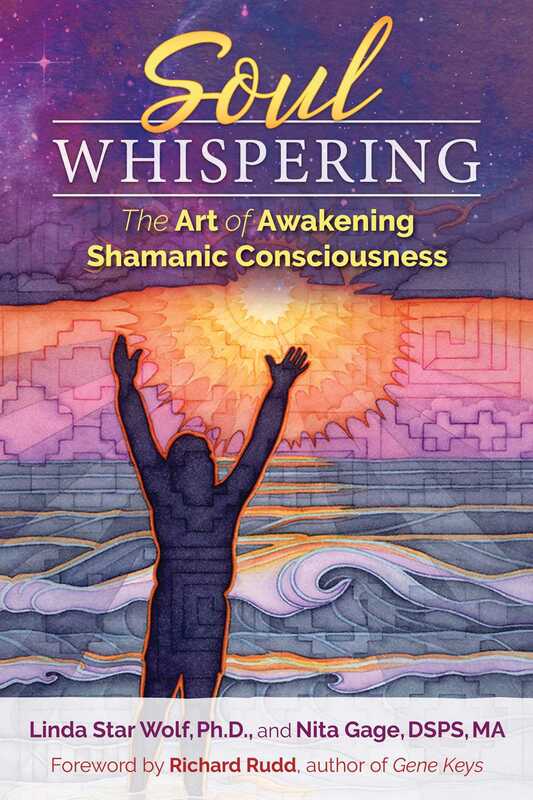 They explain how soul whispering harnesses the power of the imaginal world to awaken shamanic consciousness, restore resiliency of mind, body, and spirit, and enact transformation at the cellular level. They show how soul whispering allows you to become conscious of your wounds, release the energy of victimization, and develop love and forgiveness for yourself and others. The authors explore mythological archetypes from Sumer and ancient Egypt to empower you in your life’s journey of transformation and explain the Five Cycles of Change that we continually spiral through, detailing what to do if you become stuck in one of the cycles. Sharing the ageless wisdom of their collective shamanic experiences and personal journeywork, the authors show how soul whispering allows you to break free from your patterns of dysfunction, rekindle a profound soul connection, and shift your story from one of wounding and suffering to one of initiation and vibrancy. The time came when my life was disrupted by soul longing for wholeness, manifesting as serious depression. Through grace, I found my way to a workshop on healing into wholeness. There I met Linda Star Wolf who taught us how to discover our power animal. “Close your eyes and take long, slow breaths,” Star Wolf instructed. Native Americans teach that we all come into this incarnation energetically tethered to a particular animal--a protector, guide, and soul friend. Often we dream of or have a fondness for a particular creature. This may be our power animal. Being a “good girl” was my goal; I went to the workshop to find out how to be nicer and sweeter so that I would be happy. As I lay on the floor, I hoped my power animal would be a bunny or a hummingbird--yet I knew it was unlikely. “Let the drumming take you,” Star Wolf encouraged, as the music started and the energy began to build. “You will begin to see or sense an animal presence. It may or may not be your power animal. Ask it--and if it isn’t, let it go.” Star Wolf ’s voice guided us as we all let go into the trance of altered reality. “No, silly, I am just a bunny,” it quipped. The geese flew with me until I was plopped down in the middle of a jungle. Running toward me was a magnificent tiger. My heart pounded out of my chest, not for fear that it would hurt me, but rather knowing the tiger was my power animal. I didn’t have to ask her. It was evident that she was mine. I wanted a nice animal; instead I got a ferocious one. I feared I would cause destruction. Despite my trepidation, I reluctantly surrendered. “Slowly, find yourself returning to ordinary reality,” Star Wolf ’s voice faded into my consciousness. “Right,” I thought. “That will work for people whose animal is a bunny; clearly, I’m not going to see a tiger in the woods of rural Georgia.” Nonetheless, I dutifully set out on my walk. Rather quickly, I heard what sounded like a tiger roar, and I looked over and saw cows grazing. They looked quite frightened. It immediately occurred to me that I was still altered and had heard what I thought was a roar because I was tuned in to my imaginal tiger. I felt quite pleased with myself; I had conjured up a tiger! “Aren’t I the shamanic one?” I said out loud to the cows. Normally quite rational, I found myself in a fugue-like state of panic and rage. I was going to be the cause of someone’s death. I was determined to leave, but Jackie said, “Nita, I see you are terrified, and I want you to listen to me. What you are experiencing is deep synchronicity. You did not cause that tiger to escape.” She reached out and took my hand. Her touch along with her calm and compassionate attention dropped me out of my panic. Jackie was whispering to my soul. I stared at her for a moment and then fully grasped that, of course, it was simply synchronicity. Why did I have such a deep reaction of fear? I sensed that something was up for healing--something was trying to break through to my conscious mind--and this synchronicity was the catalyst. Rather than dismissing it as happenstance, I sat with a receptive heart and mind, allowing spirit to show me what it was trying to heal. Held in safety and guided by soul whisperers, a remarkable thing occurred: It was as though the ceiling opened to the night sky and out of the darkness, starry words began to form. You did not conjure the tiger. And here is the real truth: You did not kill your mother. She died, and it was a synchronicity that your father always told you that you were killing her. These were simple, profound, healing words that my soul needed. Held by the group energy, I cried, releasing years of grief. A piece of my soul came back that night and has stayed with me. I let go of feeling depressed and embraced my grief. The power animal brought that piece home to me, healing the layers of fear and shame--and all because of a synchronicity. Pay attention. Spirit is waiting to whisper to us at every moment. Nita Gage, DSPS, MA, has a doctorate in shamanic psychospiritual psychology and a master’s degree in clinical psychology. She is the cofounder of the NeuroImaginal Institute and director of Healer Within retreats around the world. She lives in Sausalito, California. "I cannot recommend the wisdom of this book more highly. Linda Star Wolf and Nita Gage are both responsible for my being on my soul’s path--they are the wise women healers that we all need for guidance on this glorious, but oh-so-messy, life path. This is a perfect time for the birthing of their wisdom into our changing and chaotic world--we desperately need the grounded, soul-deep guidance that they bring to each one of us. If you are in need of life or soul support, this is the book for you."